Oxytocin's effects on human social behavior aren't clear. Some studies reveal significant positive changes, yet others show none at all. In many animals, from rodents to non-human primates, it's a different story: Oxytocin has been proven to increase positive social behaviors and attention paid to others, and reduce negative social behaviors like threats and vigilance. In a study published in Scientific Reports, they found that in male rhesus macaques, the hormones flatten group hierarchy, resulting in dominant monkeys becoming more relaxed and subordinate monkeys becoming more confident. This holds even when just one of a pair receives oxytocin or vasopressin, indicating some sort of non-verbal communication between the animals. "This society, which is often described as despotic, hierarchical, and regulated by aggression and submission, becomes more egalitarian. Everyone is a little nicer to everyone else," says Platt, a Penn Integrates Knowledge professor with appointments in the Perelman School of Medicine, the School of Arts and Sciences, and Wharton. "They synchronize their facial expressions and their behavior more tightly in time. In other words, they're paying more attention to each other and when you do this, you get information more quickly and you respond more quickly." The work, the first of its kind, involved giving one macaque oxytocin, vasopressin, or saline via inhalation or injection, then pairing him seven times, six with different monkeys and once with an empty chair, in a random order. For their protection, the animals could not physically touch. However, they could interact and could see, hear, and smell each other. The researchers recorded a five-minute exchange, then two separate observers scored the behavior, frame by frame. Seven macaques participated in the inhalation work, and seven participated in the injection work. "Social dominance in monkeys is a really big deal. They live and breathe for it. But here, the curve got flattened," says Jiang, who has worked in the Platt Labs for more than two years. "If you were in the middle, you stayed in the middle. But if you were lower-ranking and you used to be timid, you got a little more assertive, and if you were super dominant, you still knew you were the boss but you were a little more chill about it. You weren't always trying to pick a fight." What's more, the alignment of actions—what's known as behavioral synchrony—when only one half of a duo got the hormone indicates non-verbal cues underlying the activity, Jiang explains. "Somehow they were conveying this information to each other," she says. "Communication was obviously not verbal, but little gestures." This is consistent with previous work from Platt showing that oxytocin increases how long one monkey looks at and pays attention to another monkey. 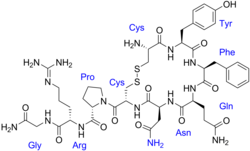 Vasopressin lead to the same outcome as oxytocin, which actually complicates the picture of how such hormones work. Receptors for the two are located in different parts of the brain, and can bind to both hormones. By injecting small amounts of the hormones into a brain area that only contains vasopressin receptors, Platt and Jiang found that oxytocin appeared to be binding to vasopressin receptors to change behavior. "Our understanding of how all of this is going to work is much more complicated than originally thought," Platt says. "We have to consider this whole other system, the vasopressin system." In theory, digging deep into these hormones and their underlying mechanisms could potentially lead to breakthroughs in therapeutic treatments for social disorders such as autism and schizophrenia and bipolar disorder. It may also help children who have had pituitary tumors removed, a procedure that can damage the hypothalamus and lead to ravenous overeating for reasons still unknown. Because oxytocin regulates feeding and social behavior, there's treatment potential there, something Platt and colleagues are testing via a clinical trial at the Children's Hospital of Philadelphia. "We anticipate that for these kids, there is a whole set of underlying social problems that people aren't dialed into because they're focused on the fact that the kids can't stop eating," Platt explains. "We're trying to determine whether when we treat them for overeating, that also improves social functions." Their reaction to oxytocin and vasopressin also seems to mirror that of people. Yet despite such incremental advancements in knowledge, there's still much to understand, Platt says. "We have a lot more to learn about how, when, and in what manner we use these peptide hormones to treat various problems."